Ok, is this just a coincidence, or an artifact of converting the Ringgit to US dollars? They were planning to spend $11.4-billion on the plant in Prince Rupert. and now they’re saying they need to cut $11.4-billion because of energy prices. Has Paddy Power updated the betting odds? it says in Capital and Operating Expenses not investment, but on that note wasn’t it in bloomberg news where the head of Petronas says he needs to know by spring if the project gets government approval? otherwise it is too late to make their timeline for delivering on their commitments to their partners. “Dare to dream” you Westcoast rousing rabblers…dare to dream. I won■t hold my breath." Not good news admittedly. However, it doesn’t say anywhere which parts of Petronas’ budget will be affected. Keep in mind that Petronas has 350bn MYR of capital spending planned over the next 4-5 years. 50bn MYR of cutbacks is only a small portion of that. Part of it will also be done through efficiency savings, in other words not all of those savings will be in capital spending. So there is every chance that this project will still go ahead. 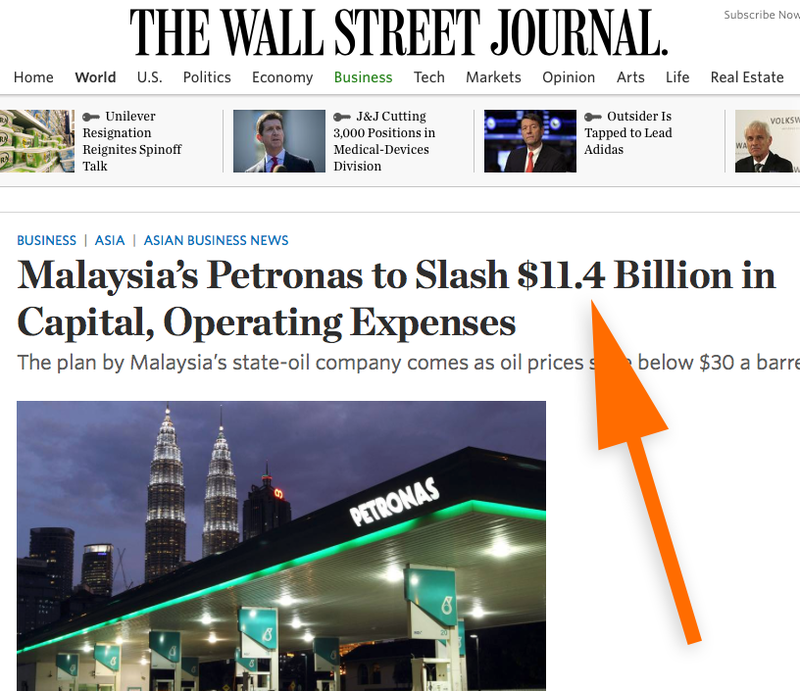 I just thought it was a weird coincidence that Petronas said they were going to trim $11.4-billion. The exact amount they said they would spend in Prince Rupert. I just thought it was a weird coincidence that Petronas said they were going to trim $11.4-billion. Indeed! I am very curious to see what happens. I think that $11.4bn is an old number anyway. They would almost certainly have pushed it lower after they renegotiated with contractors in the middle of last year. Not exactly sure how much money Petronas already spent on the project, but it’s a wasted effort if they decided to cancel it. 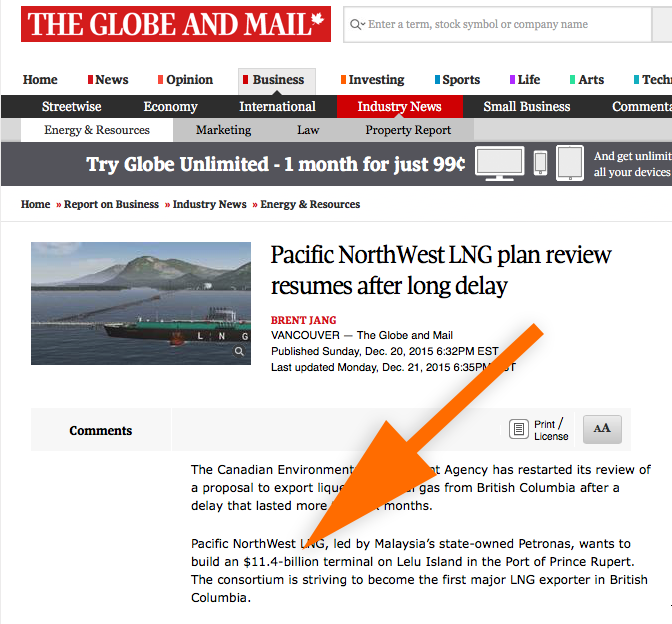 Petronas has gone silent, won■t return Christy Clark and Rich Coleman’s phone calls. Where does it state they are not taking their phone calls? Sometimes, you kinda reminded me of those ultra-religious doom folks. When’s the next rapture by the way? PS: THAT. GRAVE. ACCENT. I will never understand your love affair with that very seldom used character on the US layout keyboard. huge wall of text that you copy and paste from elsewhere. the use of an accent grave instead of an apostrophe. You are more than welcome to post, but if you have a wall of text to share, please provide a short description and a link. And the offer is still open if you’d like me to send you a new USB keyboard, still in the box. We are not at liberty to disclose or discuss the contents of the communication with external parties. Okay stglider, no need to tell your life stories. PS: Editing your post doesn’t help BTW. Christy Clark and Rich Coleman have blathered about how much natural gas British Columbia has(In the earth)…Well…Iran has 20 times the gas reserves of Canada, as a whole, not just British Columbia…Check out the below link, …Iran has the most natural gas in the world, Canada ranks a distant 20th place. Petronas does not need the British Columbia headache, not with meager margins and financial losses. “Dare to Dream” you Westcoast rousing rabblers. Have you ever heard of something called a ‘sunk cost’? Guess not. Go look it up. It is the marginal cost of production that matters, and that does not include the costs already incurred. Your $12 target price is nowhere near reality. It doesn’t factor in sunk costs, the drop in the loonie, the renegotiation of local contracts, etc etc. Petronas plans to push contractors to shift more engineering work for a proposed B.C. liquefied natural gas venture to lower-cost centres offshore as the Malaysian energy giant squeezes suppliers. Of the total $11.4-billion in estimated construction costs for the Petronas-led Pacific NorthWest LNG export terminal at Lelu Island, there would be $8-billion worth of imported goods and services spread over a five-year period. It is in that international component where Petronas hopes to find the bulk of cost savings, but the state-owned company will cast a wide net abroad and in Canada, including having TransCanada Corp. re-examine ways to make its proposed $5-billion natural gas pipeline project more efficient. Have you ever heard of something called a ‘sunk cost’? Don’t you mean `sunk cost` or sunk cost ?